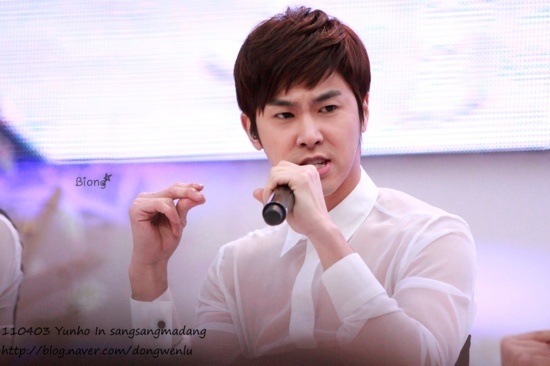 Jung Yunho (born February 6, 1986), better known by his stage names, U-Know, U-Know Yunho (in South Korea) and Yunho (ユンホ?) (in Japan), is a Korean singer and occasional actor. He is the leader of the South Korean boyband TVXQ. U-Know was born and raised in Gwangju, South Korea. He has a younger sister, Jung Ji-hye. At the age of thirteen he joined SM Entertainment, after winning a dance competition. Before debuting in 2003, U-Know appeared in label-mate Dana's music video for her song "Diamond" as a backup dancer and rapper. He has said he chose his stage name to be U-Know because as the leader of the group, he wants to understand everybody as in "I know you." and "I know that you know that I know you, so you know that i know that we know eachother". For The 2nd Asia Tour Concert 'O', U-know performed his self-composed song Spokesman. He and band-mate Micky are also featured rappers in "Heartquake" from Super Junior's Third Album, Sorry, Sorry. For the Tohoshinki 4th Live Tour 2009: The Secret Code in Tokyo Dome, U-know performed his self-composed song Checkmate in Japanese. In February 2010, it was announced that U-know would be performing in the Korea leg of the posthumous concert This Is It dedicated to legendary icon Michael Jackson. He will train in Los Angeles and Las Vegas with Genevieve Cleary, Morris Pleasure, and others who worked closely with Jackson. The project is the first joint production between Korea and the U.S.
U-know and Max appeared in the SM Town World Tour, which was started in August, 2010. The duo performed a special stage with the new single 'Maximum' on the show and 'Why' by U-know himself. U-Know has appeared on two televised shows with TVXQ, Banjun Theater and Vacation. In 2006, U-know made an appearance guest in Rainbow Romance. In July 2009, Jung was cast in the MBC miniseries "Heading to the Ground" (Hangul: 맨땅에 헤딩). On September 2010, he star in the Korea Tourism Promotional Movie "Haru: An Unforgettable Day in Korea" as an action movie star. On November , 2010, it was announced that U-Know would be a supporting actor in the Korean TV series Poseidon, playing the role of Oh MinHyuk. While the group was filming a variety show on October 14, 2006, U-Know was rushed to the hospital after drinking a beverage, which was laced with super glue, that had been given to him by an anti-fan. His manager quickly instructed him to vomit right afterward. The anti-fan turned herself in the next day. The female suspect, whose surname is Ko, was apprehended on October 16, was a member of an anti-TVXQ website for over two years. U-Know, who has a younger sister the same age as the culprit, contacted the police and requested that they not press charges against Ko in spite of the potentially severe consequences of what she did. He mentioned on a television show a while after he had recovered that the entire event "affected [him] more mentally than physically". There were many unanswered questions, such as why U-know drank from the open container, and how the culprit managed to enter the building of the broadcasting station.